WHO I FISHED WITH: This morning I fished with Mr. Mike White and his friend, Mr. Chris Lester, both returning clients who first came out with me last fall just as the water temperature was beginning to fall steadily. 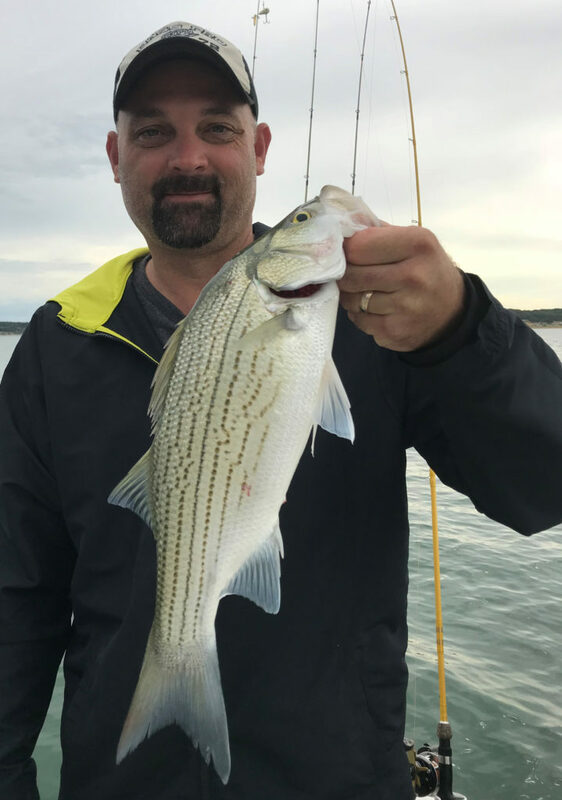 When Mike booked the trip about a month ago, I let him know that summer fishing, although fairly predictable, does not typically yield the numbers that fall and spring trips to. He acknowledged this and let me know that his aim was to better understand the tactics needed to pursue summertime fish. Chris Lester with our largest fish of the trip. With 208 fish landed, only about 6 were hybrid, and just one of those was of legal size. The white bass certainly dominated the surface bite today. The white bass we caught today were primarily 2-year class fish (~70%) with the balance being smaller 1-year class fish like the one in Mike’s (green shirt) left hand. HOW WE FISHED: We spent our first 60 minutes throwing popping corks to distinct, small groups of fish (perhaps 30ish in number), which were showing themselves on the surface as they chased shad under low light conditions from 6:30a to 7:30a. We put 24 fish in the boat during this time and then encountered a lull as the winds were calm and the sky darkened as a band of storms, of which we were on the eastern edge, moved from south to north. Things were very quiet for about an hour as this weather change occurred, with little topwater action other than by occasional rough fish rolling. Then, it happened … the winds began to blow from the west, going from 0 to ~12 mph over the next 45 minutes. 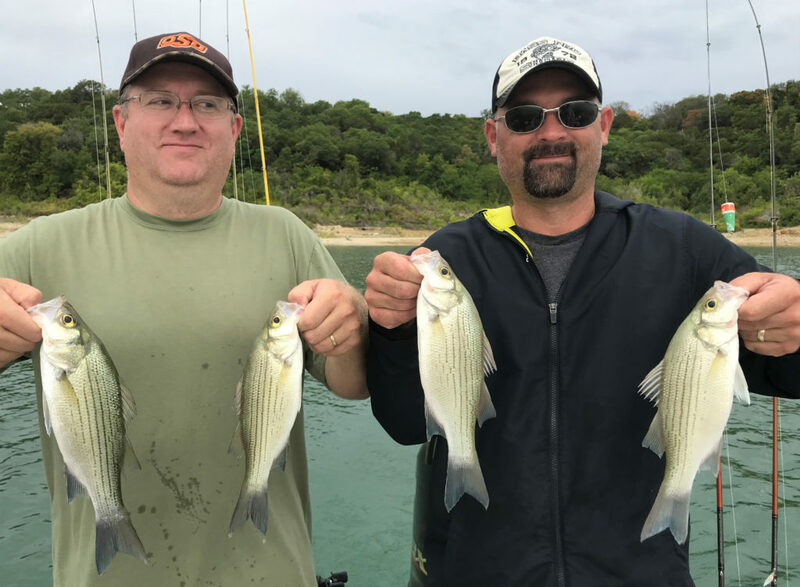 As that significant environmental event took place, a massive open water white bass feed began to take place involving thousands of fish spread over many acres. Groups of several hundred fish would drive young-of-the-year threadfin shad to the surface and feed on them for as long as the baitfish stayed pinned there — typically for 6-10 minutes at a time. At any given time, 6-10 pods of such activity could be seen across the lake’s surface. Once the baitfish escaped, another melee would erupt nearby, and so it went until the last shad was consumed at around 11:10am. During this time, Mike and Chris landed exactly 208 fish including just a handful of short hybrid and one legal hybrid. Although the popping cork rig produced well, a long-casting 8′ spinning rod combined with a Pflueger Arbor reel and a compact 3/8 oz. slab in a natural baitfish color performed even better primarily because the longer casts provided for more coverage and greater standoff distance from these fish which definitely left about a 40′ “buffer” around the boat when it was being propelled by the trolling motor. OBSERVATIONS/NOTES: This was one of the two most massive feeds I’ve ever witnessed on Lake Belton in 26 years of fishing this body of water. Spectacular!! After the west wind began, no more rain fell, although the skies were heavy and grey and it remained quite humid. All storms passed to our west and from S. to N.